My Favorite Epcot Snack | What's the Point? Yum! Sounds like I need to stop by the Italy pavilion on my next trip! You know, I was never a huge fan myself, apart from visiting the stores and seeing all the items my grandma used to give us when I was a kid. But Via Napoli and Tutto Gusto have really changed it for me! Give this girl some good eats, and you have a friend for life! Definitely Melissa! Grab a cannoli and watch the fireworks from the gondola bridge! You won't be disappointed! Yeah it's a good stop! Mixes things up a bit! Good to know, coming from a TRUE Italian (I'm just a wannabe). But, I'm a hard sale when it comes to AUTHENTIC Italian Pizza! I think we'll try Via Napoli. 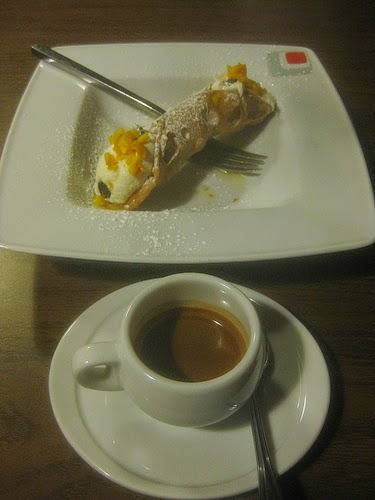 I loved the cannoli when I had one during the Food & Wine Festival!